I am unwilling to lay the following Sketches before the public, without offering a few observations explanatory of the circumstances under which the work was originally undertaken. This is the more necessary, as it will serve, in some measure, to account for imperfections of style and composition, and afford me an opportunity of apologizing for the freedom with which I have presumed to offer opinions, probably not always agreeable, nor suited to many preconceived notions respecting the character, capability, and condition of the Highlanders. Any literary inaccuracies or defects which the more learned reader may discover, proceed from the inexperience of a plain practical soldier, who passed twenty-five years of his life in barracks, in military quarters, and in camps; accustomed, perhaps, to notice passing events, and to exercise his memory, but without the least anticipation or intention of attempting to arrange his recollections in their present form. I have in fact been led on by circumstances to make the attempt, without any premeditated plan. 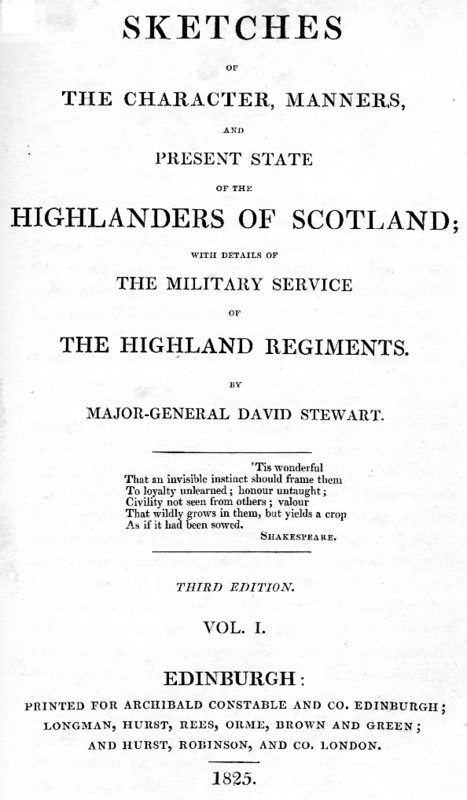 My statements, however, are grounded on authentic documents; on communications from people in whose intelligence and correctness I place implicit confidence; on my own personal knowledge and observation; and on the mass of general information, of great credibility and consistency, preserved among the Highlanders of the last century. From the confidence derived from these circumstances, I fear I have been led to attach more importance to the subject than will generally be admitted to belong to it, and to express myself with a freedom and warmth which many may consider reprehensible. If I am found to have erred in this respect, and to have expressed myself in language unsuitable to the subject, or unbecoming the character which I am ambitious to maintain, my only defence is—an honest and perfect conviction of the truth of all I have advanced, and of the vital importance attached to several points touched upon, both in the Sketches and in the Military History. The origin of these Sketches and Military Details was simply this:—When the Forty-second regiment was removed from Dublin to Donagha-dee in the year 1771, the baggage was sent round by sea. The vessel having it on board was unfortunately driven on shore by a gale of wind, and wrecked; the greater part of the cargo and baggage was lost, and the portion saved, especially the regimental books and records, was much injured. A misfortune somewhat similar occurred, when the army, under the Earl of Moira, landed at Ostend in June 1794. The transports were ordered round to Helvoetsluys, with orders to wait the further movements of the troops. But the vessels had not been long there, when the enemy invaded Holland in great force, and, entering Helvoetsluys, seized on the transports in the harbour. Among the number of vessels taken were those which had conveyed the Forty-second to Flanders, having on board every article of regimental baggage, except the knapsacks with which the officers and soldiers had landed at Ostend in light marching order. Along with the baggage, a well-selected library, and, what was more to be regretted, all that remained of the historical records of the regiment, from the period of its formation till the year 1793, fell into the hands of the enemy. After the conclusion of the late war, his Royal Highness the Commander-in-Chief directed that the Forty-second should draw up a record of its services, and enter it in the regimental books, for the information of those who should afterwards belong to the corps. As none of the officers who had served previously to the loss of the records in 1794 were then in the regiment, some difficulty arose in drawing up the required statement of service; indeed, to do so correctly was found impossible, as, for a period of fifty-four years previous to 1793, the materials were very defective. In this situation, the commanding officer, in the year 1817, requested me to supply him with a few notices on the subject. After some hesitation and delay, I commenced; but merely with the intention of noting down as much as would cover about thirty or forty pages of the record book. I did not, indeed, expect that my knowledge of the subject would enable me to extend my statement to greater length, especially as I had kept no journal, and had never even been in the habit of taking any notes or memorandums of what I had heard or seen: but as I proceeded, I found that I knew more, and had a better recollection of circumstances, than I was previously aware of, although, in the multiplicity of facts I have had to state, some inaccuracies may afterwards be discovered. I had, indeed, possessed considerable advantages. Several old officers of great intelligence belonged to the regiment when I joined it. One of these had not been a week absent from the day he entered in the year 1755. His wife, too, who was a widow when he married her, had joined the regiment with her first husband in the year 1744, and had been equally close in her attendance, except in cases where the presence of females was not allowed. She had a clear recollection of much that she had seen and heard, and related many stories and anecdotes with the animated and distinct recitation of the Highland senachies. Another officer, of great judgment, and of a most accurate and retentive memory, had joined the regiment in the year 1766; and a third in 1769. I had also the advantage of being acquainted with several Highland gentlemen who had served as private soldiers in the regiment when first organized. The information I received from these different sources, together with that which I otherwise acquired, led me on almost insensibly till the narrative extended to such length, that I had some difficulty in compressing the materials into their present size. It then struck me, that I could, without much difficulty, give similar details of the service of the other Highland regiments. In the course of this second investigation, I met in all of them much of the same character and principles. The coincidence was indeed striking, and proved that this similarity of conduct and character must have had some common origin, to discover the nature of which appeared an object worthy of inquiry. The closest investigation only confirmed the opinion I had before entertained, that the strongly marked difference between the manners and conduct of the mountain clans and those of the Lowlanders, and of every other known country, originated in the patriarchal form of government, which differed so widely from the feudal system of other countries. I, therefore, attempted to give a sketch of those manners and institutions by which this distinct character was formed; and, having delineated a hasty outline of the past state of manners and character, the transition to the changes that had been produced, and the present condition of the same people, was obvious and natural. Hence I have been led on, step by step, from one at-tempt to another, till the whole attained its present form. A work, thus undertaken as it were by accident, and without any previous plan or design, one part of the subject naturally leading to the other, may claim some indulgence for a writer whose only qualification is a tolerably intimate knowledge of the subject, conjoined with a great and earnest desire to do it justice. I trust, therefore, that, from the enlightened reader who takes these circumstances into consideration, and reflects on the difficulties which a plain soldier, unaccustomed to composition, had to encounter, in making such an attempt as that now respectfully, and with great diffidence, submitted to the Public, I shall meet with that liberal share of indulgence which I so much require, and which, all circumstances considered, will not, I trust, be denied me. These Sketches, which, with extreme diffidence, I lately submitted to public notice, having met with a more favourable reception than I could ever have ventured to expect, and a large impression having been rapidly disposed of, I am now encouraged to offer a Second Edition, with a degree of satisfaction which I could neither have hoped for nor anticipated. I have been farther gratified, by receiving numerous communications, confirming the general correctness of the great multiplicity of facts and circumstances which I have had occasion to detail. In a few instances, indeed, the friendly observations of others have enabled me to correct some errors of no great importance, being principally mistakes in dates and omissions of names, of which I have gladly availed myself in this edition. It cannot but be satisfactory, that more numerous alterations have not yet proved necessary; as, in the great mass of statements I have heard, not always coinciding in terms or in circumstances, I frequently experienced extreme difficulty in detailing military operations in such a manner as to afford satisfaction, or appear correct, to all who were present; every moment, every change of position, often assuming a different aspect, according to the distance, particular station, and capability of the observer to form a correct judgment of what passed under his notice. I therefore publish the Second Edition without any material alterations, except a few additional anecdotes and observations, which, from the necessity of compression, and other circumstances, I was obliged to leave out in the first impression of the work. A Second Edition of 1300 copies having been rapidly thrown off, while the demand for the work continued in a great measure unabated, I made early preparations for a Third Edition, the printing of which was forthwith commenced. But owing to the distance of Garth from the Press, and having no daily Post, with other causes of interruption, this proceeded so slowly that the publication of the present Edition has, in consequence, been delayed for more than a year beyond the time at which, in justice to the work, it ought to have appeared. The delay thus occasioned has, however, been attended with one important advantage; it has afforded me time and ample opportunities of re-examining my statements, and of applying corrections, where such appeared necessary. If I have seen cause to make but few alterations, with hardly a qualification, even in those economical views which are, of course, most liable to be disputed, it is solely because the result of the most minute inquiries, and of personal observation, has strikingly confirmed the general accuracy of my statements and reasonings, and affords me additional confidence in the truth and justness of the opinions which I was previously led to maintain. 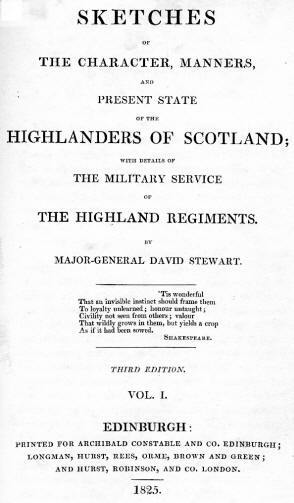 I employed three months of 1823 in this personal investigation, and travelled upwards of one thousand miles through the Highlands, always communicating with the most intelligent, and those best qualified by their judgment, general intelligence, and local knowledge, to give the most correct information, and unprejudiced opinions, on the subjects of my inquiries. Receiving the fullest confirmation from such men, I have now the more satisfaction in adding, that while I thus exerted myself to render the present Edition as correct as possible, the alterations are so few and unimportant as not to diminish in any degree, the value and general accuracy of the former Editions. PRESENT STATE AND CHANGES OF CHARACTER, MANNERS, AND PERSONAL APPEARANCE. Military Character—National Corps advantageous, especially in the Case of Highlanders—Character of Officers fitted to command a Highland Corps.